When my alarm went off at 6:15 am on Sunday morning, I groaned and hit snooze. My body was not accepting Daylight Savings Time, and all I could think about was how it still felt like 5:15 am. I pulled the covers aside before the buzzer went off again, and rolled out of bed. It was a big morning. 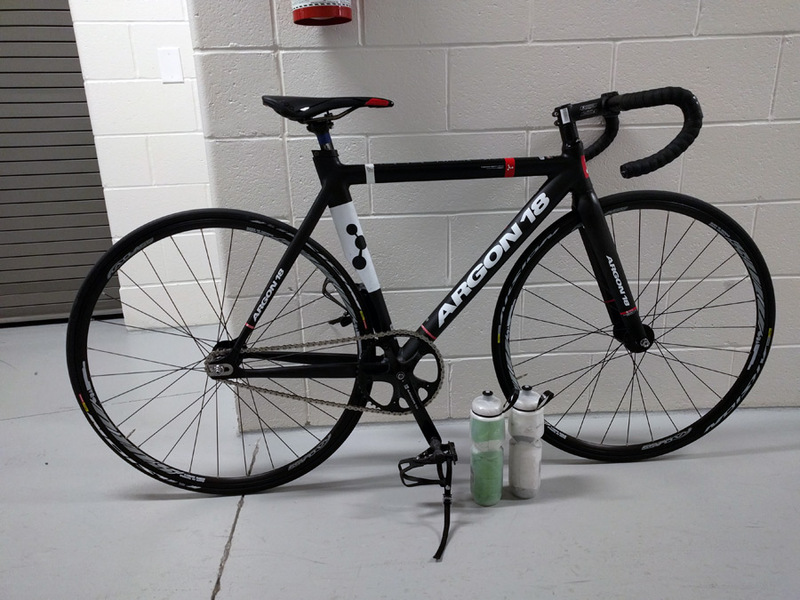 Hubs and I were invited to experience track day at the velodrome in Milton, Ontario. We were asked to arrive at 8:15 am – so bloody early! We woke early so that we could grab breakfast at McDonald’s before riding, and our timing was perfect. We arrived right on time and met with our group. 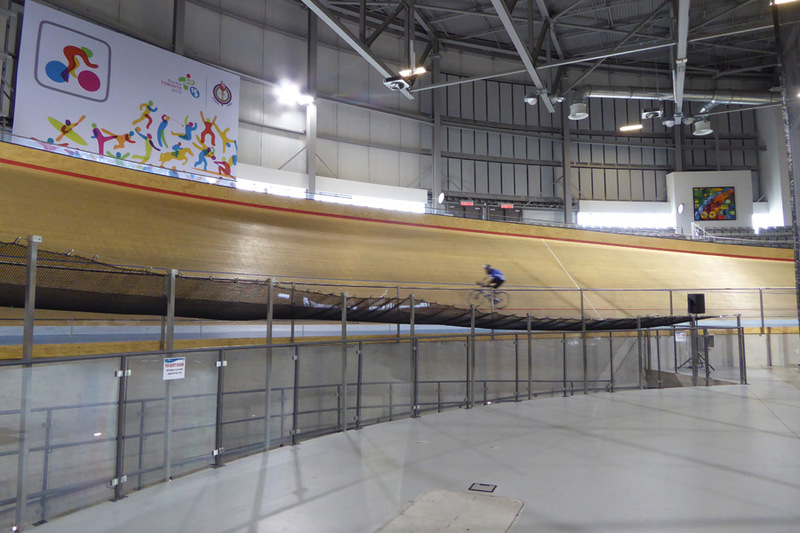 The Mattamy National Cycling Centre is a track cycling facility that was built for the 2015 Pan Am Games. It is 250-metre timber track, with two 42-degree banks. In order to keep it running year-round, basketball and badminton courts have been built in the centre of the track, and there are other fitness facilities that are within the building. Currently the location of this venue is in the middle of nowhere, though with urban sprawl, this won’t be the case for too long. 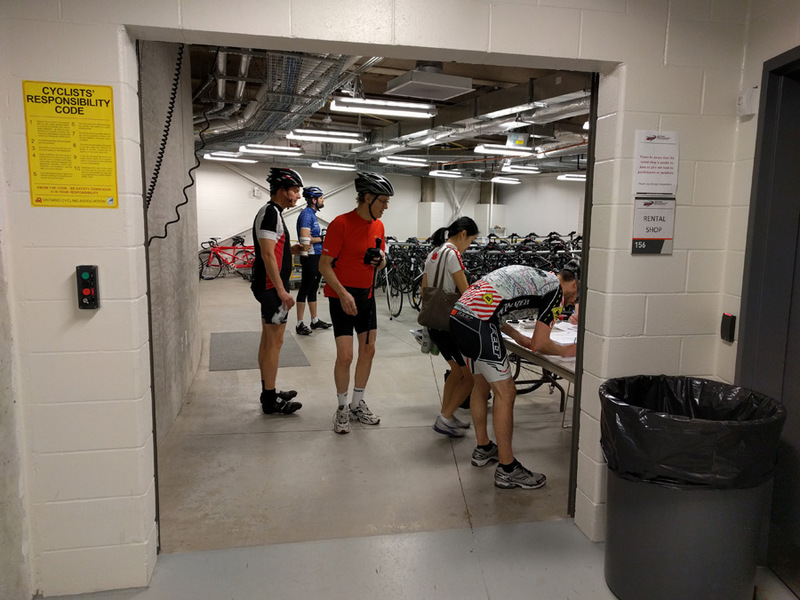 After changing into our cycling gear, we went to the rental area to get fitted on their track bikes, and to sign our life away. You cannot ride a regular road bike on the track. Track bikes are fixed gear bikes without breaks. I was advised of this prior to arriving, so I “practiced” riding on a fixie. My very first time on it, I almost cried in panic when I didn’t know how to come to a stop. Hubs clearly thought I was being ridiculous because “it’s just a bike”, but it was so new too me. The last time I rode a fixed gear bike would have been when I was small enough to ride a tricycle. It isn’t the fact that the bike has no brakes that makes it so foreign, rather it is the inability to coast. Your legs never stop turning. I spent about 30 minutes on the fixie, and decided I could do this. This is the bike I was assigned. I chose not to ride clipped, but in hindsight I should have brought my road shoes. The toe cages were frustrating; however, I was not aware that their bike rentals came with light action clips, which is what I use. Bottom line, ride clipped in! Next to all the guys’ bikes, mine looked so small! My confidence somehow diminished as soon as we were at the velodrome. The bike was unfamiliar, and I was riding with a group of people I just met. My fear of falling or crashing was holding me back. One of our two leaders seemed to see the fear on my face, and he tried to calm my nerves, but it didn’t help at that moment. In situation like these, I just need to get myself out of that fearful/negative state-of-mind, and push through to the other side. I usually get there, but it’s not dependent on what people to say to me. It’s just something inside of me that flips a switch and my apprehensions turn into determination. The instructors did a good job of easing us onto the track by getting us to take small steps. We first started out with riding slowly around the base of the track to get a feel for the bikes, and slowly they had us riding and stopping, speeding up, doing shoulder checks and all the other safety related things, and finally before letting us on the actual track, they observed our riding speeds. One by one, as we reached 25-30 km/hr, they would instruct us to make our way up the track. Before I allowed myself to do this, I did have to ask hubs for some advice. The banks (the turns) are steep, at 42 degrees, and I didn’t understand how I would stay upright. Did I have to lean into the track floor, and if so, how much? Hubs told me I shouldn’t have to lean. Just ride through. Our instructors told us that we don’t have to ride too much harder around the turns to prevent slippage; however, the uncertainty made me really power through the turns – as in, I would go 110% on those banks. I stayed around the red line, but the others would get up high because it’s pretty amazing to then fly down. The angle of the banks might not mean much to you, but it’s incredible to see in person, and quite terrifying and thrilling when you’re riding it. What I did learn about myself from this experience is that I’m not physically fit enough to be a track rider right now. It is an intense cardio workout, because you literally cannot stop pedaling. The longest I was able to maintain the speed was for five laps, and then I’d have to pull off to catch my breath. I’ve recently started taking Pilates classes, but maybe I need to do more heart pumping activities. 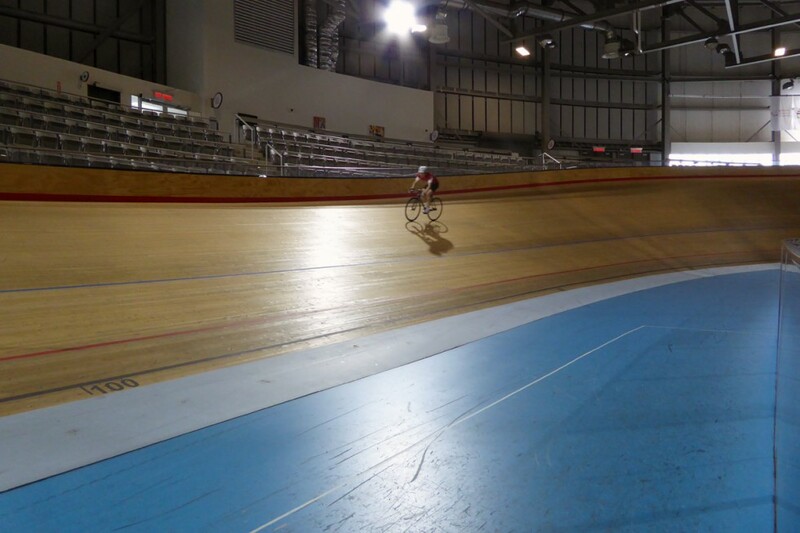 Riding in the velodrome was such a fantastic opportunity, and I am so happy I had a chance to do it. I’ll admit that fixed gear is fun, but for now, I’ll just stick to road cycling with gears because I have no issues with coasting.